With a need for a shake up, Bryan teamed up with Electric Light Orchestra frontman and producer Jeff Lynne in 2015. The resultant album, ‘Get Up!’ is mostly unlike anything to appear in the Bryan Adams catalogue before. It is, however, a lot like many things with which Lynne has had a creative hand. …But then, if you call upon Jeff Lynne for production duties, you know exactly what he’ll do. The gated snare drum will be in full effect, there will be a few slide guitars inspired by George Harrison’s mid 70s work and there will be a strong focus on a lot of mid-range sounds. In short, ‘Get Up!’ – far from being like a spiritual cousin to his ‘Reckless’ youth, as occasionally hinted – is Bryan Adams’s “Wilbury Record”. Jeff may have only co-written one tune of the nine (the rest penned by Adams with his familiar collaborator Jim Vallance), but even so, the results are frighteningly Wilbury-fied, perhaps even more than many would have originally guessed. The most blatant example of Jeff’s handiwork comes as a kick starter: although only produced by Lynne, ‘You Belong To Me’ could easily be one of his leftovers, being a shuffling rock ‘n’ roller that recycles the best bits of Traveling Wilburys’ ‘Rattled’ and Lynne’s own ‘Don’t Let Go’ [from his own ‘Armchair Theatre‘]. An over-filtered, fifties style twangin’ geetar is hugely present from the outset, the gated snare is in full force; Lynne’s production is shiny and professional. Somewhere in the middle of this musical backdrop – that, admittedly – Lynne could have foisted upon pretty much any singer of his choosing – is a familiar and slightly gravel-toned voice. Adams never sounded like this before…it’s a bit of a shock, but armed with this jaunty arrangement and a reasonable hook, it all works, against the odds. Perhaps, more importantly, for the first time in years, Adams sounds like he’s having fun. ‘Go Down Rockin” is much more like the Adams we’ve all come to expect. A thinner guitar tone during the intro hints at his 80s work, but with the rest of the band joining, this mid-paced and very radio friendly affair soon settles into a more pop-rock groove akin to a few tracks from ‘On a Day Like Today’. The chorus is a little repetitive, but a pleasingly easy riff and a few woo-hoo’s lift the spirits and the guitar solo, while perfunctory, seems well placed. A couple of hints of Lynne shine through – occasional stabbed piano and a drum that nods to ELO’s ‘Don’t Bring Me Down’ are evident (and naturally become more obvious with each play) but it’s not Wilbury overkill…at least for now. The album’s first ballad, ‘We Did It All’, meanwhile, couldn’t be more blatant a Wilbury homage. Lynne does for Adams here what he did for the Beatles on their two ‘Anthology’ singles in the 90s. In fact, with its mid paced chug and overly earnest vocal, this could even be ‘Real Love’ if you don’t listen too closely…or even closely. Similarly pulling from a tried and tested mould, the upbeat ‘That’s Rock ‘N’ Roll’ is a top feel-good tune. Adams, with some multi-tracked harmonies and an an infectious backing works through three minutes worth of radio friendly pop. A simple song, granted, but again, it sounds very much like a band having fun. The only small bug-bear is that you might find yourself wondering if it sounded so much like a track from Tom Petty’s ‘Into The Great Wide Open’ at the writing stage, or whether that’s purely down to Jeff’s signature at the sign-off. Revisiting an energetic style, ‘Thunderbolt’ combines a rattling snare and chunky guitar riff to create a sharp verse, before a high pitched guitar and harmonies flesh out a very simple, but very infectious chorus. Midway, a stronger harmony and rock ‘n’ roll piano stoke up the fun, before a quasi-raucous guitar break threatens to derail everything. At a mere two and a quarter minutes, this rousing rocker is one of ‘Get Up!’s best tunes. Yes, it’s utterly disposable, but not all music needs to be treated as a grand artistic statement. Elsewhere, Bryan proves he’s very much about equal opportunity homage on ‘Don’t Even Try’ – sounding like something from Roy Orbison’s ‘Mystery Girl’ with an equal mix of pre-Beatle heartbreak and 80s shine – and ‘Do What You Gotta Do’ which, in more than a few respects, sounds like something from ELO’s ‘Balance of Power’. Any similarity to ELO isn’t coincidental either, since Lynne appears in both a songwriting and performance capacity on this particular number. His multi-tracked voice on the chorus is absolutely unmistakable right to the point where you could even forget whose album this is. From a purist’s perspective, this isn’t a very good BA album in the traditional sense – those days that seemed to last forever in the ‘Summer of 69’ are farther away than ever. 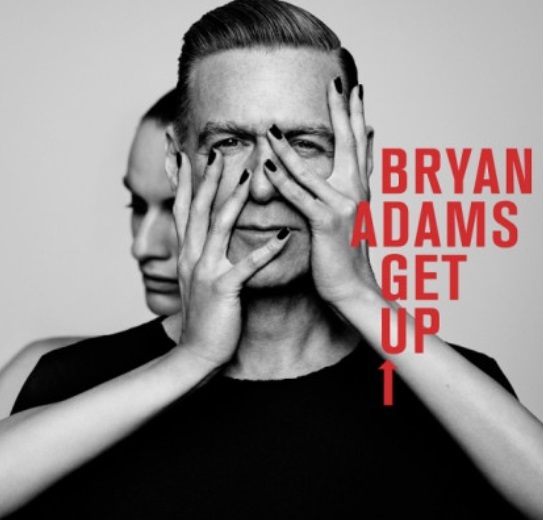 What ‘Get Up!’ is, however, is a thoroughly enjoyable collaboration between Adams and the bearded Brummie, with Lynne firmly in the driving seat. If you like Bryan Adams but never loved the Wilbury sound then you’ll hate this, but conversely, if you’ve often found yourself indifferent to the Groover From Vancouver but have a soft spot for any or all things Wilbury, you may just find yourselves enjoying this far more than you ever expected. One to file next to Roy Orbison’s ‘Mystery Girl’, Tom Petty’s ‘Full Moon Fever’ and George Harrison’s ‘Cloud Nine’, ‘Get Up!’ might just feel like a Bryan Adams album in name only in a few places…but somehow, as a whole, it’s still far better than anything he’s put his name to since ‘Waking Up The Neighbours’ back in 1991. Highly recommended. This entry was posted in Album & EP Reviews and tagged bryan adams, electric light orchestra, elo, jeff lynne, pop, power pop by Real Gone. Bookmark the permalink.